First notice std::vector&apos;s memory usage on the very left: as expected it is very fast as it&apos;s just a dynamically resizing array. But due to doubling of the internal buffer it uses 1.5 times more than the raw storage: 8 Mi key/value pair each 8 bytes (as ints are still 4 bytes) take 64 MiB. Doubling required additionally 32 MiB, thus in total 96 MiB are needed, which matches the plotted spike. The std::deque is slightly slower, but uses only about 64 MiB of raw storage. Now regard the memory profiles of the map containers: the red-black tree has the highest memory overhead for integer pairs, as two pointers are added in each node (enlarging each node size times three). However, the hash maps also have a high memory overhead. Apparently, both hash map implementations dynamically resize when a fill threshold is reached, requiring temporary memory while reinserting into the new table. Of course, the hash maps are unsorted and allow excepted O(1) access time. However, the map container with lowest memory overhead (and fastest for insertion time) was STX B+ Tree. It required only about the same amount of memory as a vector, one third of an STL map, or about half of a hash map. This is due to the fact, that the B+ tree contains fewer pointers. Consequentially, there is really no reason not to replace an STL map with the STX B+ Tree for mapping integer keys to pointer or integer values. That includes integer to std::string maps or other indirectly referenced objects. Of course, for larger key/value data types this is may not be true, as here the gain by reducing pointers may not out-weigh the overhead of additionally allocated "empty" slots. A few questions regarding your malloc count: Are you also considering the overhead of the management datastructures of the allocator. I don&apos;t know how todays malloc allocators work, but I&apos;m sure you need at least a pointer, the size of the block and maybe additional bytes to ensure alignment for each allocated memory block. So allocating less objects (esp. if they are small) should also considerably shrink the real memory footprint. While we are on this topic: My favorite allocator is the "obstack" one from gcc/glibc, it&apos;s an arena style allocator and is sometimes considerably faster if you allocate alot of small obejcts though obviouslty it&apos;s not a general purpose allocator. Also a note to the memory consumption of the hashmaps: AFAIK the STL/gnu STL only comes with hashmaps using linked lists to resolve collisions, you might try a hashmap using linear probing like the one from the "google sparse hash" project. no, malloc_count does not include the internal memory data structures of whatever allocator is behind malloc(). The counting happens at the malloc()/realloc()/free() interface layer, which is intercepted by redefining the symbols. By counting on this level, the resulting statistics exclude whatever mechanisms the lower-level allocator uses, which you almost always want to do to concentrate on your application. 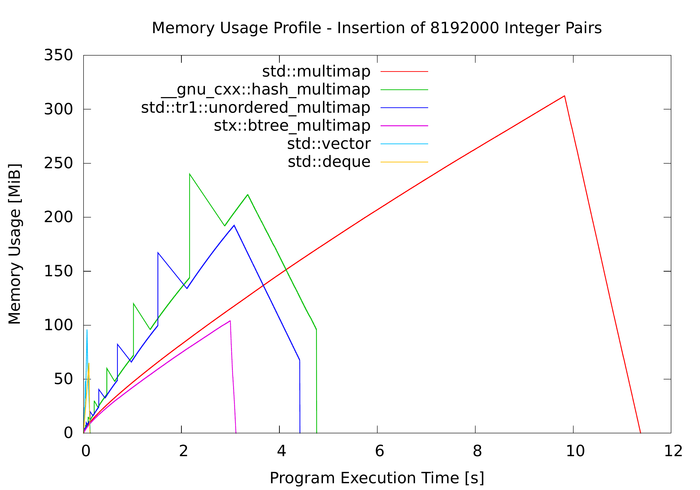 If you want to do system-level memory profiling, then you must not only include the allocator&apos;s structures, but also the kernel&apos;s page tables, memory householding and what not. Yes, there are many allocators out there, but I don&apos;t know of any comparison.